There’s no shortage of ideas for how to make new instruments. And once upon a time, the MPC sampler (bottom right) was a new idea. Roger should know; aside from being a successful musician and producer, he’s one of the best-known designers of modern electronic instruments. His LM-1 Drum Computer is accepted as the first modern drum machine. (Technically, it was the first-ever programmable, sampled drum machine, but that makes it the first sampled drum machine as we now know it.) At Akai, he pioneered the legendary MPC series. The AdrenaLinn, as covered today, is a collaboration with synth builder Dave Smith. Smith, maker of many beloved synthesizers and the “father of MIDI,” will in turn work with Linn on the upcoming BoomChik. So, that covers what springs from Roger’s brain — what ideas from other instrument designers excite him? People have been coming up with new ways to improve musical instruments for just about forever, but what interests me personally are the new ideas that break entirely with mechanical interfaces in favor of high-tech sensor interfaces, and particularly ones that can produce–or at least attempt to attain–finely nuanced musical subtlety. And these aren’t just solutions in search of a problem: he notes that, wonderful as they are, guitars, keyboards, string instruments, wind instruments, and conventional computers all have limitations. 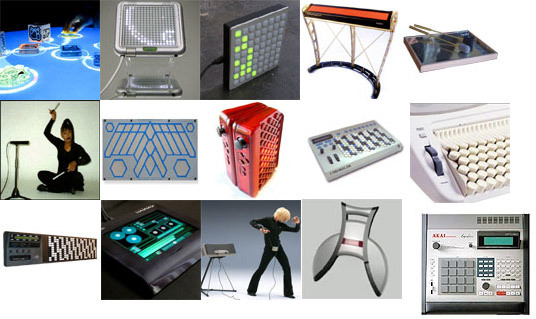 Interesting solutions: the ReacTable interactive table, the Tenori-On and Monome grid-style controllers, expressive controllers like the Max Mathews Radio Baton and Don Buchla Lightning II, alternative keyboard interfaces, the Lemur touchscreen, and others. Thanks for the link and the kind words, Roger. It’s great to see these exchanges of ideas, once the province of a couple of academic journals and the occasional print review, happening in real-time online between the designers themselves!